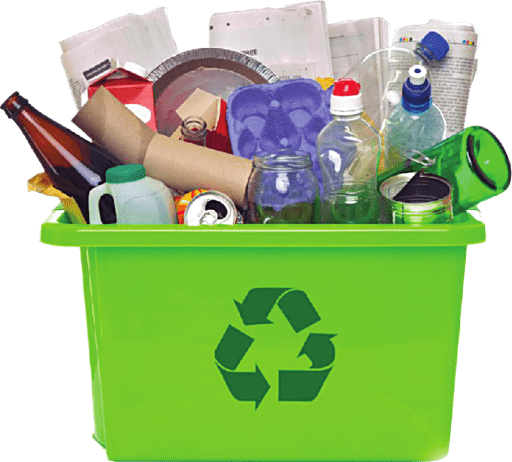 We offer recycling in our front-load containers for metal, cardboard, wood, etc. Trash Kans also offers single stream recycling containers. Single-stream (also known as “fully commingled” or “single-sort”) recycling refers to a system in which all paper fibers, plastics, metals, and other containers are mixed in a collection truck, instead of being sorted by the depositor into separate commodities and handled separately throughout the collection process. Single-stream recycling programs make it easier for individuals and business to recycle. In single-stream, both the collection and processing systems are designed to handle this fully commingled mixture of recyclables, with materials being separated for reuse at a materials recovery facility. Below are lists of acceptable and unacceptable items. The following items should NOT go in our single-stream recycling containers.